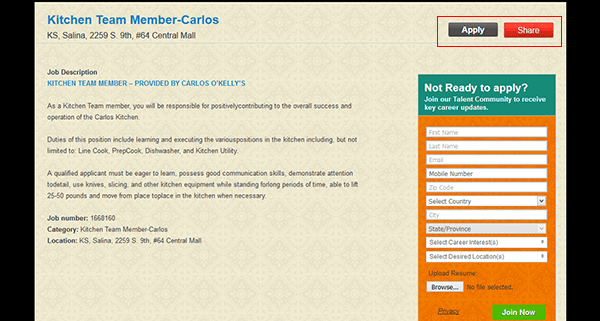 Search for current openings online and fill out/submit the Carlos O’Kellys job application on the company’s employment website. Follow the steps in the below instructions to learn how to search the list of current openings, register for a new account, and complete the online hiring process. Numerous types of positions can be applied for including both management and hourly roles. 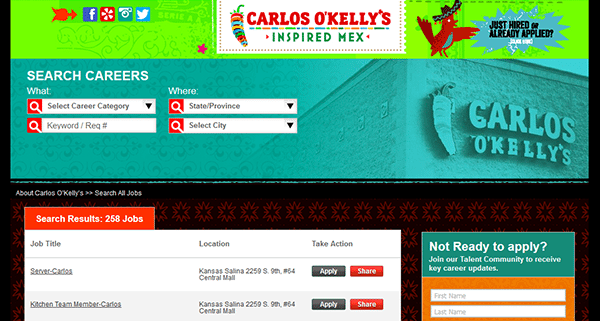 About the Company: Carlos O’Kellys is an American chain of Mexican-style restaurants based out of Des Moines, Iowa. The restaurant chain was founded in 1980, and operates locations throughout the Midwestern region of the United States. Step 1 – Copy and paste the following URL into a new tab/window within your web browser. Press the button at the top of this page to go directly to the company’s jobs site. Step 2 – The list of current openings can be searched by entering a keyword or selecting one of the options from the drop-down lists (in the search form near the top of the page). The results will automatically update. 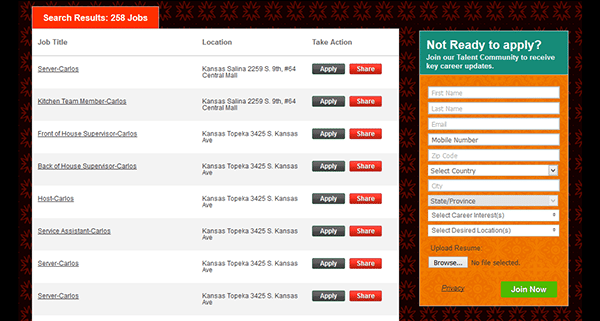 Step 3 – Click the title/link of the job that you want to submit an application for. Step 4 – Read the job description and then click the button as outlined in the below screenshot. Step 5 – Log in to your account, or press the “Start Here” button to open the registration form. Step 8 – After all of the sections have been completed you will be able to submit the application for processing. Note: Applications typically take 3-10 business days to process/be reviewed.